Roughly 1.5 years ago (in June 2015) I wrote a post titled 1,000,000 Visitors to Cardio Trek. Well, sometime today, March 31st 2017, likely halfway through the day, we finally reached the 2,000,000 mark. It took 3.5 years to get our first million visitors. It only took roughly 1.6 years to get our 2nd million. Clearly we are doing something right. I don't want to estimate when we will reach the 3 million mark, but hopefully the rate of growth continues. 550 pages on topics ranging from weight loss, muscle growth / weight lifting, cardio exercises, sports advice, and lastly dietary / nutritional advice. Free. 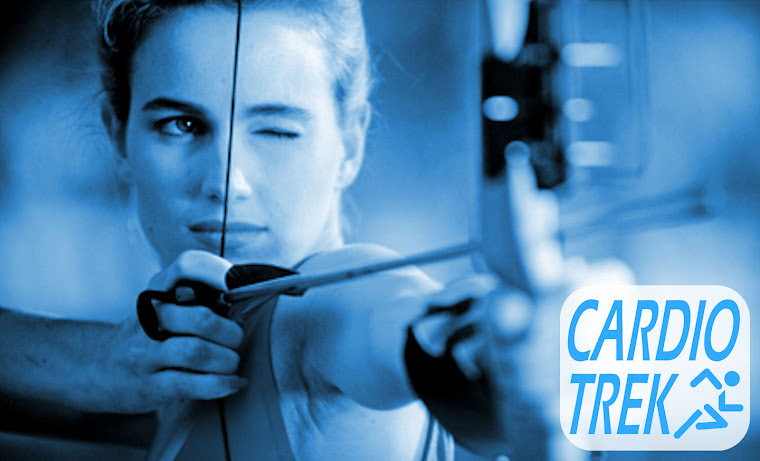 Cardio Trek is home to Toronto's "best archery instructor - according to testimonials. 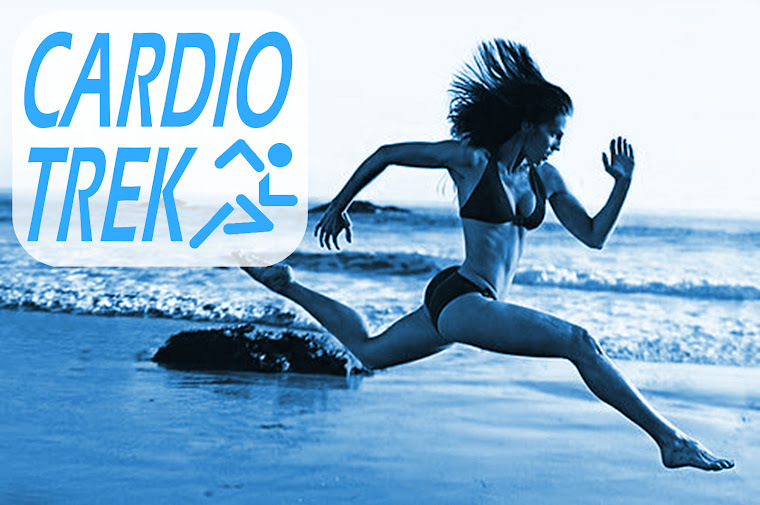 Cardio Trek offers a number of unique / bizarre exercises and tips that are rarely seen elsewhere. 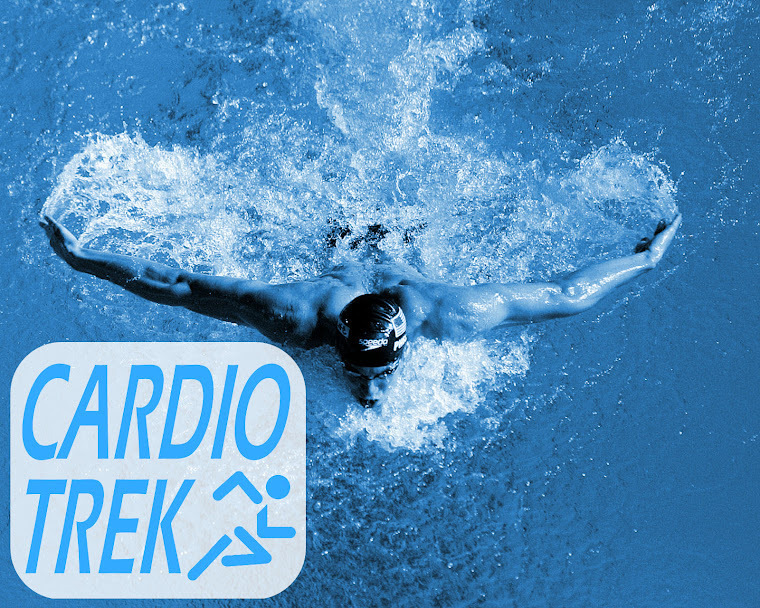 If you Google 'cardio personal trainer toronto' then CardioTrek.ca is the #1 personal training website that comes up in the results. CardioTrek.ca is also #2 too. We make a special effort to make Cardio Trek fun to read. Still the best archery instructor in Toronto. Just have lots more testimonials now. 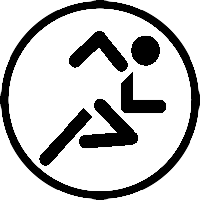 Still offering a selection of unique and bizarre exercises - the lists just keep getting longer. 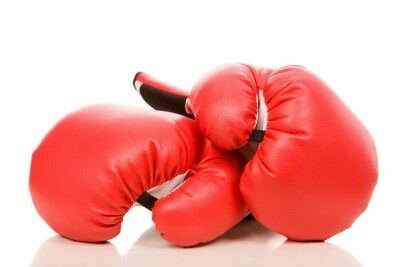 If you Google 'cardio personal trainer toronto' then CardioTrek.ca is #1, #2, and #3. Still dominating the top of the roster in Toronto, just more so. We still keep making an effort to making Cardio Trek fun to read. Mostly because we enjoy writing things that are fun, and therefore don't waste time writing about boring subjects. My cousin last year gave the wife and I an ice cream maker as a wedding gift and we have been experimenting with making ice cream since then. The great thing about having your own ice cream mixer is that you can experiment with lower calorie recipes and also make frozen yogurt, thus creating your own low calorie versions becomes comparatively easy - and you can use the ice cream and/or yogurt when eating berries, bananas, nuts, granola, etc. 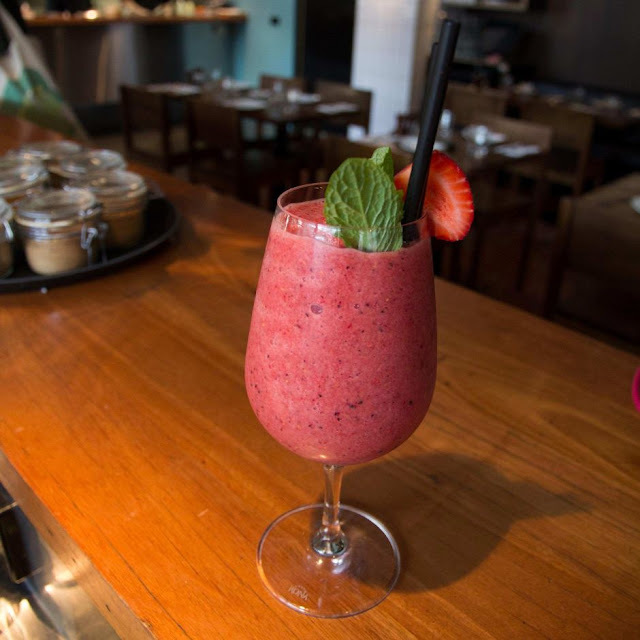 And whether you mix or make a smoothie, there are many ways to use it too. Decades ago my Aunt Carol got some special hiking sticks, which looked like ski poles, for Christmas and at the time I was a teenager and thought they were silly and unnecessary. My mother later tried using them and also liked them and got something similar for when she goes on walks. However as I have gotten older and done my share of hiking, I have determined having a walking stick of some kind is handy for really steep hill climbs (to help with balance, to hook onto trees to help pull myself upwards, etc) and have long since determined them to be very useful. 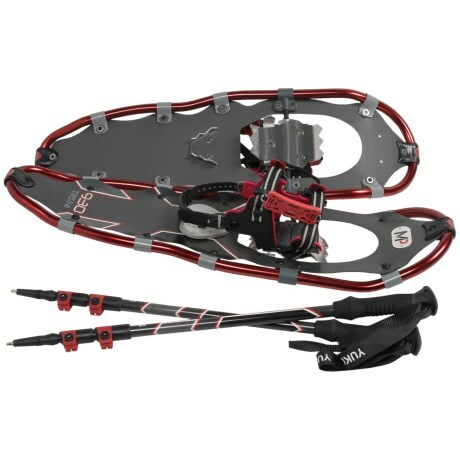 When I purchased snowshoes a few years back they came with 'snowshoe poles', which ended up being very useful for snowshoeing and staying upright - it is surprisingly easy to fall over when you lose your footing in snow. 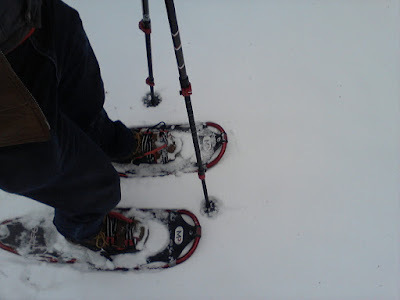 Last year I even went snowshoeing in April after a Freak Snowstorm, and did a post about it. See photo below for my snowshoes and poles in action. So yes, I have definitely changed my opinion about walking sticks. The Classic Walking Stick - A stick you pick up and just use - perhaps even carved so it is more interesting to look at. Usually about the length of a cane or a bit longer. Hiking Staff - Typically made of wood, carved, often a lot taller than your normal walking stick, closer in size to a quarterstaff used by "Little John". Might even be decorated with feathers and/or paint. The "Gandalf" of walking staffs. Trekking Poles - Ergonomic handled poles similar to ski poles, designed using lightweight but durable materials, spikes on the bottom for better grip. Hiking sticks and trekking poles help take the load off your feet, legs, and back. By employing one or two additional points of contact with the ground, your upper body can help offset the strain on your lower body and core. Hiking sticks and trekking poles help improve your balance. Even experienced hikers occasionally find it difficult to keep their balance while carrying a heavy pack. By giving yourself an additional point of contact (or two), you’ll benefit from much better stability and balance. Hiking sticks and trekking poles make it possible to cross more difficult terrain when necessary. 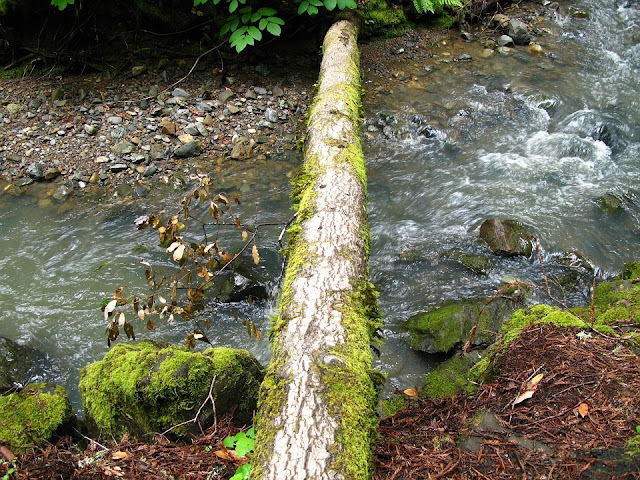 If you are forced to cross a stream, climb a steep hill or negotiate a sandy dune, you’ll have much better success if you use a hiking stick or pair of trekking poles. Hiking sticks and trekking poles provide a small measure of increased safety vs predators. While they certainly aren’t designed for the purpose, hiking sticks can help increase your apparent size should you encounter a coyote, bear or stray dog that gets too close for comfort. And I can think of a few more things to add to the list. You can use the pole as a hook on trees to help pull yourself upwards while climbing steep areas. You can lean on the pole when tired. 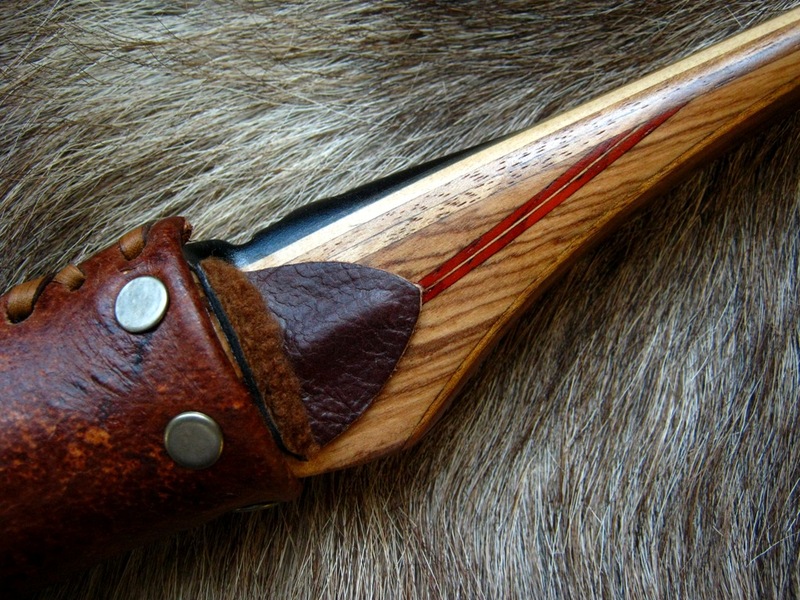 If it is a really good wooden stick and you have a carving knife handy, you could begin the process of carving a longbow while you are walking - you know, for fun. Then you just need to braid or twist some plant fibre together to make a bowstring. You can have swordfights with friends while hiking, for fun. 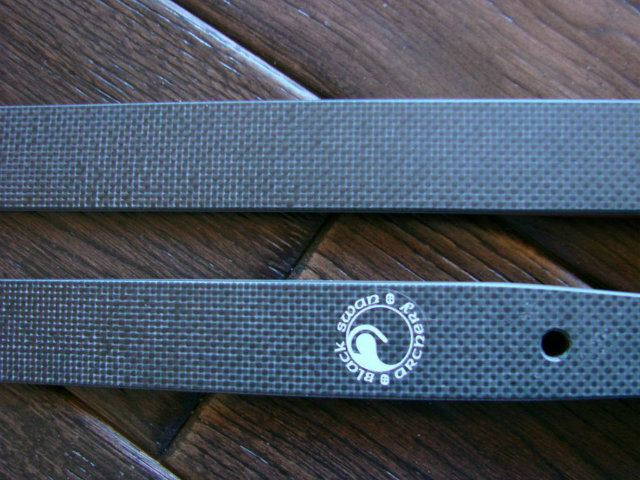 For thwacking it against rocks or trees to make noise - because music is fun, even in its crudest forms. Also handy for scaring away predators with the noise. To keep your arms busy, trekking poles keep your arms in motion which gives you a better upper-body workout while you are walking so you burn more calories. Increased safety while making your way across something precarious, such as a log that bridges a small stream. Not everyone would walk across that, but I would do so easily with a walking stick for extra balance. This year global warming seems to be in Toronto's favour. I just checked the forecast for the next two weeks and there is only one snowy day (March 3rd) coming up for the city of Toronto. There is supposed to be a little bit of rain next week, but the average temperature will be getting very warm in a hurry. Historical averages are also handy for predicting how warm the weather will be, but with global warming we can expect it to be warmer than average. 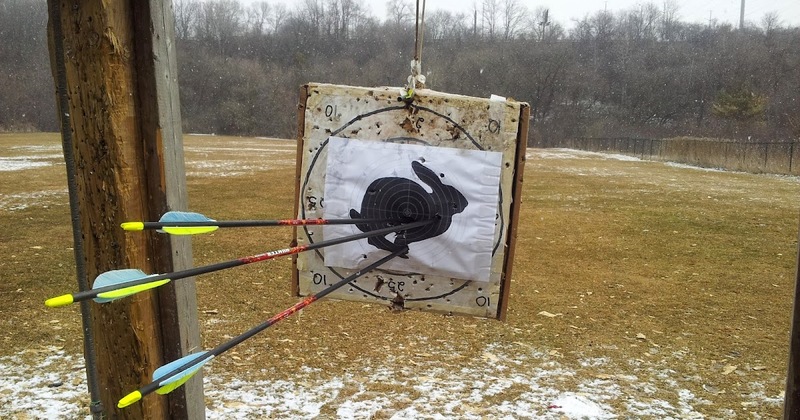 In the photo below you see a homemade moving target I made two years ago for Easter weekend (April 2015). See the amount of snow on the ground? Very little. But that was April during a very long winter we had back in 2015. In contrast if you go outside today, March 1st, and there is no snow at all. None. We are clearly having a very short and mild winter this year. On Friday, March 3rd the forecast is calling for 5 mm of snow. Just a tiny bit. Probably will melt by Saturday. So how can we take advantage of this lovely weather? Start booking Archery Lessons right now. Because if you wait too long all the warm weather days will be booked up for the rest of the year.